As we age, sometimes our thought process is to let things unfold, however, youthful skin isn't only for the young. Being a writer in the beauty industry for many years has taught me to always be open to possibilities. Finding skincare products & procedures which will suit an individual based on need is one that I support. 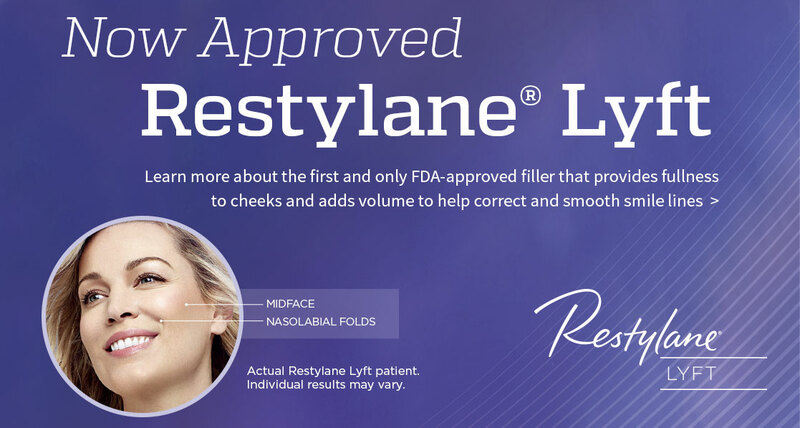 The buzz about Restylane® Lyft caught my attention right away! The first and only FDA approved filler for cheek augmentation and the correction of moderate to severe smile lines. So I set out to meet with one of the best Dermatologists Atlanta has to offer, Dr. Anna Pare, the most gifted of doctors when it comes to talking skin health and aging. Just to let you know, my curiosity about skincare started at a very early age. As a child, I lived in Florida. My Parents were a stickler for safety everything. So each morning, my Mother slathered sunscreen on my face, neck and arms before going out to play at the beach. As I grew into a teenager and older, I was often teased due to the pale halo from the sunscreens of the time on my dark skin. I wore it anyway. Topical skincare products peaked my interest as I grew up, even more than makeup did, and I was determined to find out all I could about keeping the skin healthy and beautiful. As technology & science advanced, better alternatives for health & defying the age process became available. Of course, first and foremost, most talked about was proper healthcare, like hydration and foods that are full of nutrients; activities, to keep the body functioning and running smoothly and topical protection against outside environmental elements, such as sun & pollution. The foundations of basic skin health will never change, however, we are living longer, so aging skin is a common thing we all share as we advance in age. What to do? Think of alternative resisters, such as topical creams and fillers. Meeting with Dr. Pare at Dermatology Consultants to talk about the aging skin alternatives like FDA approved Restylane® Lyft was very engaging! She is quite knowledgeable in the field, of course, working many years to achieve her current credentials. Knowing such, I was more excited and curious to see what she would have to say about my skin health, and if Restylane® was the product for me, since I, being very proud of my aging process thus far, am starting to have a few concerns! The consultation included, with her assistant Sydnee, a brief medical review, an up close and personal hands-on skin analysis, a list of my possible issues and addressing my concerns. Dr. Pare never seemed rushed or even concerned with the full waiting room of patients. My time and appointment was very personable, I was impressed, because in this day and age of rushed doctors, my time with her was my time. I ended up not being a candidate for a filler at all. We each have a very unique genetic make up, so some need a little bit more help than others. I am not one of those people yet, however, knowing I have a future option in well-researched products with FDA-approval such as Restylane® Silk and Restylane® Lyft is very relieving. Readers! If you are interested in Galderma's Restylane® products, the Aspire Galderma Rewards program is an amazing opportunity for individuals to earn extra benefits when using Galderma aesthetic treatments. Each member also receives a $20Treatment Certificate which can be applied towards his or hers next treatment. Visit AspireRewards.com\whatshersecret today!